Unfortunately, not everyone has the privilege of being martyred for the faith. Most have the more ordinary, but no less blessed privilege of living and dying what we might call a normal life and death, in the faith given them in their baptism. So in the 11th century AD, the Church circled November 2nd as a day of commemoration and thanksgiving to God for all the faithful who have departed this life in faith and who now enjoy the blessed, BEATIFIC VISION. And so November 2nd became known as “All Souls Day” on the Church’s calendar. 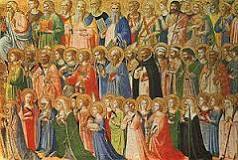 With that said, it seems like what we have been calling, “ALL SAINTS DAY” is more like what the Church had in mind when it established “ALL SOULS DAY.” None of these names whom we have named this morning, died a martyrs death because they confessed Jesus Christ as Lord. Today, we give thanks to God for all souls who were born again by the power of the Holy Spirit and by the same Spirit of Truth, given the gift of faith in Jesus Christ, and by the same Spirit of Power, were preserved in the one, true faith and who have been raised by the LORD AND GIVER OF LIFE out of this world of suffering and trials and tribulations and brought in to the presence of the glory of God. As we sang earlier, these are “the unsung saints, that countless throng, who kept the faith and passed it on…” (LSB #678) Their names will never be written on the Church’s calendar and they will not be remembered for very long, except by their families and friends and brothers and sisters in Christ. But their names are written in the BOOK OF LIFE that was sealed with its seven seals, which the Lamb who was slain broke open by His death on the cross and His resurrection from the dead. Some of these whom we have named, you may not know either. But some, we know quite well. These are fathers and mothers, husbands and wives, sons, best friends of some of us here this morning. Time has passed and the anguish of the grave has faded. Death has lost the sting that it once had. And we give thanks to God for that too. But unlike the vast majority of the world that can only think of their dead as friends and loved ones from their past, the Christian Church has always confessed that those who have died in Christ, are just as ALIVE and as much of the “one, holy, Christian and apostolic church” as we are, and that it is not THEY who have left us, but WE who eagerly anticipate being reunited with them. It was G.K. Chesterton who once said that the Christian Church is the only organization on earth that does not disenfranchise their members just because they have died. The resurrection of Jesus Christ from the dead and His ascension to heaven means that death is now only a flimsy and paper thin barrier that stands between us and them, BUT THAT CANNOT SEPARATE US FROM EACH OTHER because ALL are gathered around the Lord Jesus Christ and there is only ONE LORD. Which, just to be sure we understand this rightly, means that they are NO CLOSER to the Lord than we are. Or, to put it another way, we are NO FURTHER from the Lord than they are. Because there is only ONE LORD. Just as the Church on earth once beheld Him hidden in the pillar of cloud and fire, we now behold Him hidden in the water and bread and wine. But it is the same Lord and Savior whom the Church in heaven beholds “face to face” that ‘we see in a mirror dimly…” (1 Cor. 13:12). And this ‘faith’ that we confess with our lips spills over onto the way that we remember and speak about those who have died in the same, saving faith. We don’t need to pretend that they were perfect people or ‘worthy’ of eternal life. We’re perfectly free to remember and even speak of them as ‘sinful and unclean’ just like we are. They sinned against God and against their neighbors and even against us, by what they did and by what they left undone, just as we do. This is the shout of praise and thanksgiving that goes up from the one, holy Christian Church at all times and in all places. We wear the same glorious clothes as they do because we were baptized with the same baptism as they were, in which all of our filthy rags were washed and made white the blood of the One, Lamb of God. I have sometimes wondered if their “cry with a loud voice” might not be due, at least in part, to the utterly shocking realization that they had been wearing these white robes ever since they were born again in the holy water. Now in heaven, they not only SEE GOD AS HE IS, but they seem themselves as GOD CREATED THEM, in HIS IMAGE, HOLY AND RIGHTEOUS IN HIS SIGHT – a truth that they always struggled to believe and trust as long as they were alive in this world. “Now they know fully what they had only known in part.” (1Cor.13:12). There, on the day we now call “Palm Sunday,” Jesus came to set His Church free from the grip of death and hell by His blood shed for them on the cross and by His resurrection from the grave on the 3rd day. And His people welcomed Him with waiving palm branches and songs of praise, “crying out ‘Hosanna! Blessed is he who comes in the name of the Lord.” (John 12:13). Now, standing before the throne of God in heaven, the same Christian Church waives their palm branches in thanks and praise to the One who has come in the name of the Lord, and has delivered them out of this GREAT TRIBULATION and into His eternal glory. The angels, the elders and the four living creatures before the throne of God. The prophet Isaiah found himself before the throne of God. And in the presence of the holy, holy, holy God, he was terrifyingly aware of his sin, particularly, his unclean lips. And angel seared Isaiah’s lips with a coal from the altar and said, “See your guilt has been taken away and your sin has been atoned for.” But now every unclean lip has been sanitized by that which comes from the altar – hot coals for Isaiah – bread and wine for you and me, the beatific vision for those whom we have named. We dare not wait until we die to join them in their hymn of praise. Every Sunday as we gather around the throne of the Lamb, we take our place in that multitude. We join our praise with the ‘angels and archangels and all the company of heaven, and laud and magnify’ His glorious name. All One, Holy, Christian and Apostolic Church. All together, in every time and in every place, declaring the great “Amen” to all that God has done for us by the cross of Christ and His empty tomb. As you and I join our voice to theirs, we do so with the assurance of faith that our names have also been written in THE BOOK along with theirs and that the day will come when we too will be called out of this great tribulation and into the beatific vision.